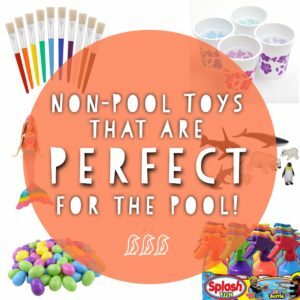 Non-Pool Toys that are Perfect for the Pool! Our family loves hanging out at the pool, and could literally spend all day in the water! But, I know I’ve said it before, I am not a fan of typical water toys. Any toy that has a hole to squirt water usually ends up in the trash within a few weeks as I begin to see the mildew inside. Hard little animal toys – my kids LOVE animals! So the hard little animals that you can buy are awesome! They might be a little expensive (several dollars per animal) but they hold up. Weather it’s in the dirt, the mud, the sand, or the pool, these animals go everywhere with us. Well… the last two are meant for the pool, but you get the idea 🙂 Look through your child’s toys and your kitchen cabinets before heading to the pool next time to see what ideas you can uncover!